As we all have noticed Cloud Computing has become the next best thing that has hit IT in a long time. Every company all of a sudden has a product that is “in the cloud”. It’s good to see that a lot of companies are boarding the train, but it also results in confusion and a feeling that is “it’s just to good to be true”. 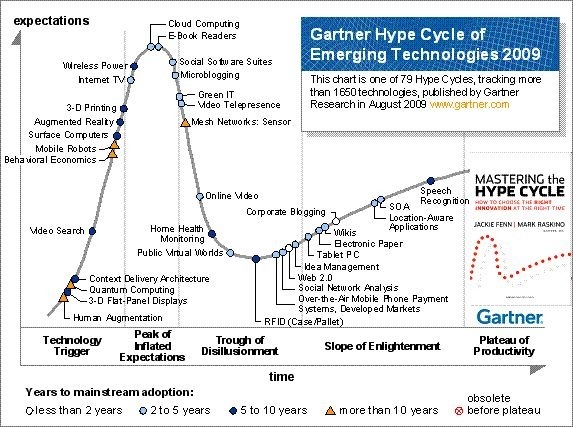 This can also be seen in Gartner Hype Cycle for Cloud Computing. Cloud Computing is currently at the top op the so called “Peak of Inflated Expectations”. It has been hyped by the IT industry and is indeed generating a lot of expectations. As Gartner predicts this will eventually result in “disillusionment”. Thinking that it’s just one of those “IT things” that will eventually fade away and be replaced by another big hype. Proceed with caution; Don’t believe everything that is said / written about Cloud Computing. There is a lot of rubbish out there. Rational thinking is the key. Inform yourself; Knowledge is power! Gather as much information as possible about the subject. But again Proceed with Caution! Fit it into your strategy; No rush! But Cloud Computing should eventually fit into your IT strategy. Keep it in mind making future decisions. Your not the only one; There are more people / companies out there dealing with the same “cloud”. Talking amongst peers helps a lot in generating your own vision regarding “cloud computing”.